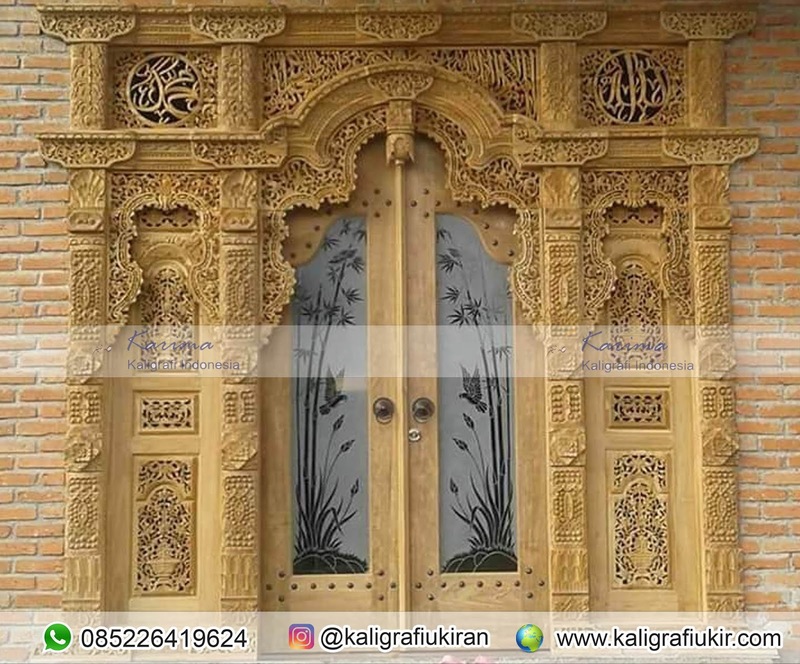 The door of the calligraphy gebyok is indeed very attractive, the door made with teak wood and filled with carvings does indeed have its own charm. The carvings found in almost all of their bodies give a very thick impression of ethnicity / culture. For those who like art, this door is suitable to be installed in their homes. This beauty appears with a neat traditional feel. Usually gebyok made from teak wood is one of the prima donnas for those who love old-style housing. So what is the function ?? Types of wood used. The wood used is of various types, on average is durable and strong wood. Therefore, gebyok is not only applied to indoor rooms, but also as residential gates. Complexity of wood carving details and ornament decorations. Well, if this is certainly no doubt. 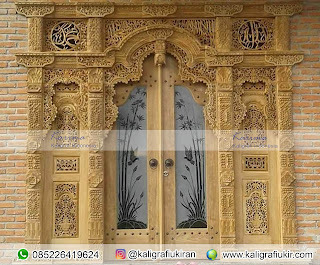 The details of teak wood carving on the gebyok are known to have a high level of complexity, not to mention each layer of dimension on the door usually has a different but continuous type of carving when put together. About Size. The bigger the more expensive. Even this applies to the quality assessment of teak door gebyok. Because, the bigger the gebyok, the more detailed carvings on wood in a broad field. Not to mention more wood material used. 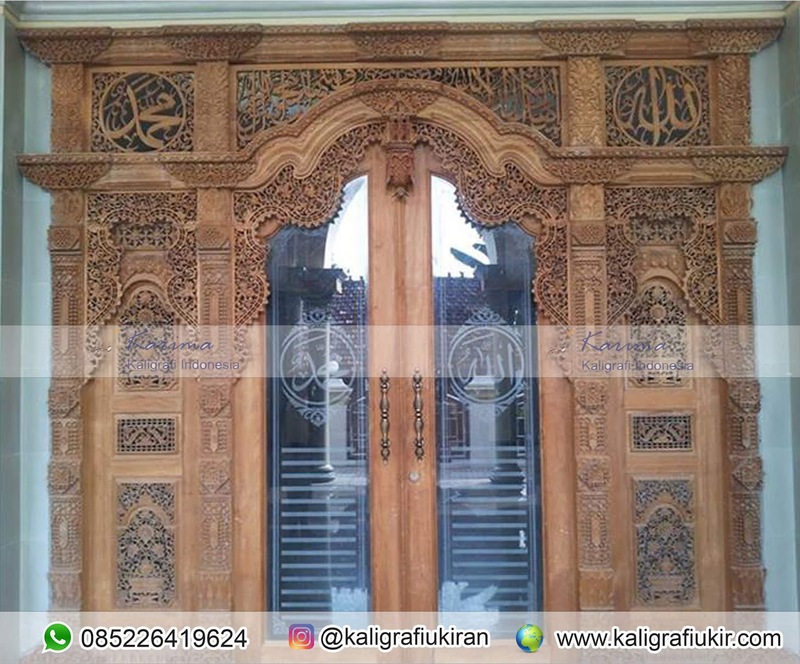 Because the manufacture is done by quality wood craftsmen, then do not doubt the beauty of the details of the gatiok pintu jati. As a craft, gebyok has a widespread function. Although previously only functioned as a partition inside, now gebyok is often used as an entrance gate. Not only beautiful wooden furniture, gebyok is a high-taste art work. Not unlike the treatment for wooden furniture, gebyok also performs the same steps. Because of the many carved details on the gebyok, use a small, soft brush to reach difficult areas. Cleaning the gebyok requires precision so that the results are optimal. To clean the door of the calligraphy gebyok regularly, you just need to use a duster to remove dust and dirt that sticks to most areas of the gebyok. Different placements, different treatments. For gebyok placed outside, you should clean it regularly and don't forget to coat the gebyok with a protective layer. 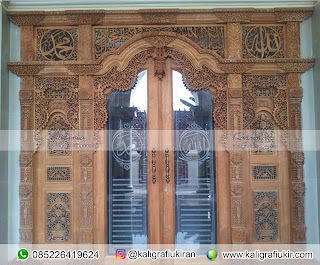 0 Response to "The door of the calligraphy gebyok for Your Home"